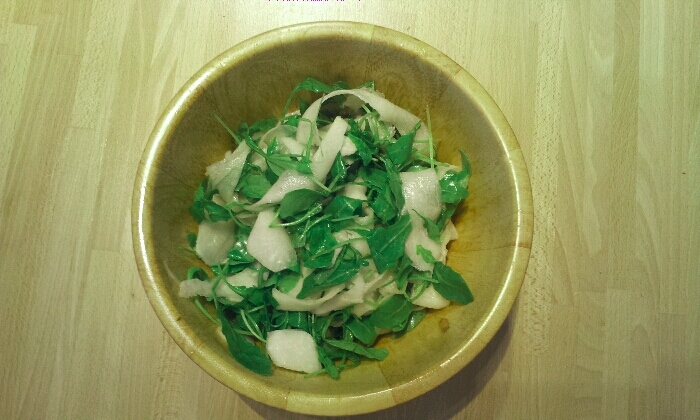 This was just a quick salad of roquette leaves and ribbons of radish (diakon /mooli/large white radish see photo below). I peeled it with a vegetable peeler (discarding the outer skin), carried on peeling strips and finely sliced the middle core, which is milder. Make a dressing of three tablespoons of rice-wine vinegar, dissolve in this, half a teaspoon of brown sugar (to balance the acids and bitter - it should not be sweet once mixed in). Mixing in half olive oil and half grape-seed oil to six times the vinegar. Whisk well. I served this with some grilled chicken breasts marinated in hazelnut oil, salt, thyme and pink pepper corns.